Celebrate 10 Days of Wildness with Nat Geo WILD’s Thanksgiving Lineup! Looking for something exciting to watch with the family after the big Thanksgiving feast, but not really feeling the love for football? Nat Geo WILD has you covered with 10 whole days of awesomeness, kicking off on Thanksgiving! From Big Cats to intimate views of Yellowstone, prepare to “ooh,” “awwww,” and maybe even “OMG, eek!” during Nat Geo WILD’s 10 Days of Thanksgiving! *As a Nat Geo WILD Blogger, I receive complimentary gifts from time to time along with information to share about Nat Geo’s programming. I am under no obligation to post and all opinions are my own. 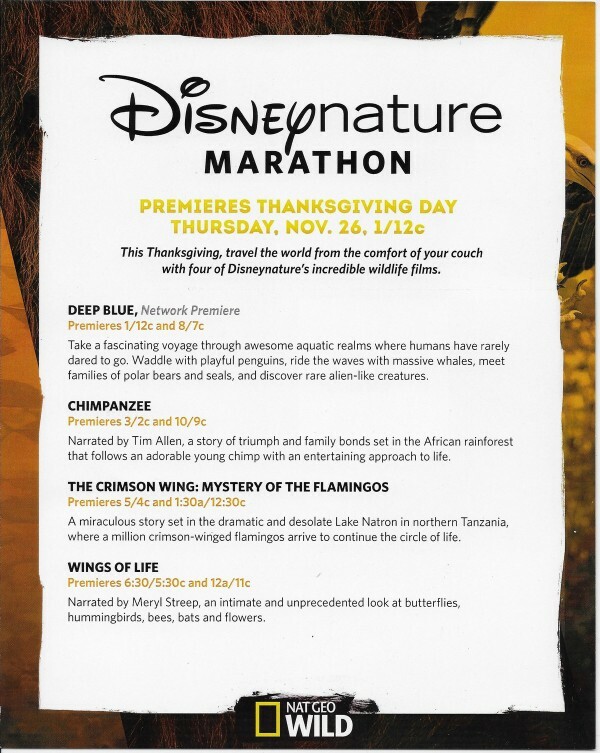 The exciting lineup starts off on Thanksgiving Day (Thurs, November 26th) at 1PM with a Disneynature marathon. I’m already queuing up my TIVO because there are a few I haven’t seen yet! The marathon starts with Deep Blue, a network premiere. If you miss it, catch it again at 8pm EST. Deep Blue takes you on a fascinating journey through some of the most awesome aquatic realms that humans rarely have a chance to see. Waddle with penguins, ride waves with massive whales and hang out with families of seals and polar bears. You’ll even discover rare, alien-like creatures! Chimpanzee Premieres at 3/2c and 10/9c. This is one of my favorites! Narrated by Tim Allen, it’s the story of the strong family bonds between chimps, following the life of a sweet, adorable young chimp with a happy, entertaining approach to life. The Crimson Wing: Mystery of the Flamingos premieres 5 and repeats at 1:30am EST. Narrated by Mariella Frostrup, this is a miraculous story set in the dramatic and desolate Lake Natron in northern Tanzania, where a million crimson-winged flamingos arrive to continue the circle of life. Wings of Life premieres 6:30 and repeats at 12AM. Meryl Streep narrates this intimate and upclose look at the life of butterflies, hummingbirds, bees and flowers. This is one I’m really looking forward to seeing! After you’ve had your fill of Disneynature flicks, dive into Big Cat Week at 9PM EST (8C) on Friday, November 27th (plenty of time for you to rest after any Black Friday shopping!). This year’s event is Nat Geo WILD’s biggest ever, with FIVE new premieres plus a live African safari! The event kicks off with Cougars Undercover, a moving story of two mountain lion mothers raising their cubs, each trying to survive the harsh conditions of a bitter winter season outside of Jackson Hole, Wyoming. The never-before-seen video is part of a groundbreaking study by Panthera’s Teton Cougar Project to determine why the Cougar population is suddenly dropping in the Rockies. Now there’s no passport required to go on the trip of a lifetime to see big cats up close and personal. 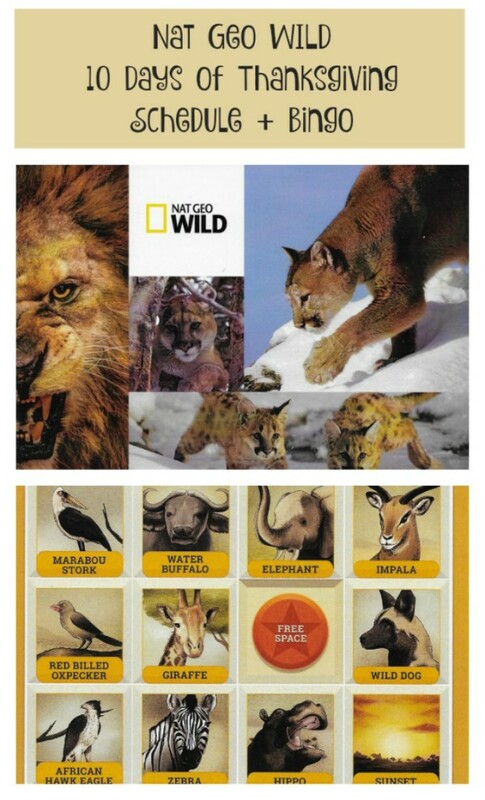 Nat Geo WILD provides you with two expert guides who will lead the way to stunning wildlife, in real time. 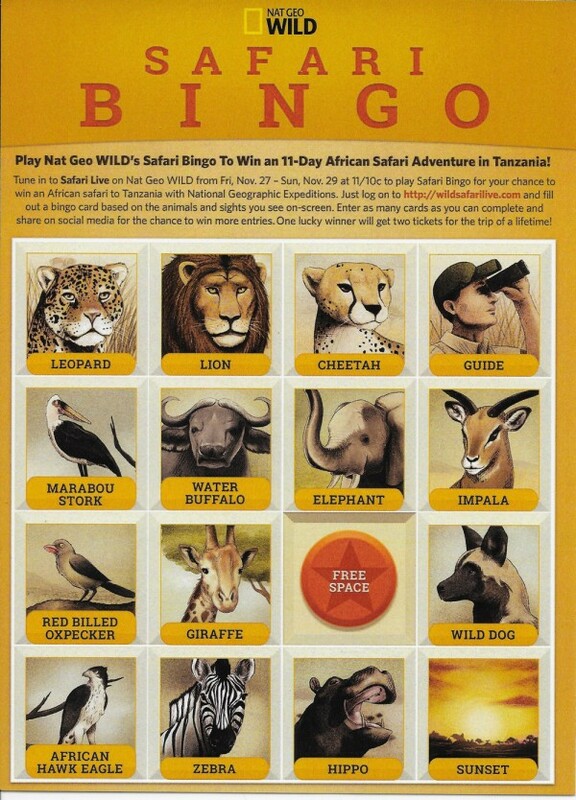 You can follow along with their online bingo game to win your very own African safari, and even reach out to the guides to ask questions via email and Twitter. Big Cat Week is more than just a TV event. It’s an extension of the Big Cats Initiative, a long-term commitment by the National Geographic Society to stop poaching, save habitat and sound the call that big steps are needed to save big cats around the world. Finishing off Nat Geo WILD’s 10 Days of Thanksgiving with whole new look at Yellowstone, from the producers of “The Art of Flight.” Wild Yellowstone took two years to film and features cutting-edge film making, drone use, time-lapse and infrared technology to capture scenes that we’ve never seen before. The film kicks off a cross-network 100th anniversary celebration of America’s national parks. The series continues on National Geographic Channel with 8 hours of programming throughout 2016. The two-hour event includes a visit in summer and in freezing winter, an extraordinary world of fire and ice, ever changing and always testing its animal inhabitants. Which Nat Geo WILD 10 Days of Thanksgiving shows are you most looking forward to? I will definitely been tuning in for some of these! It sounds like an awesome lineup! I love this channel–these look like some great shows! 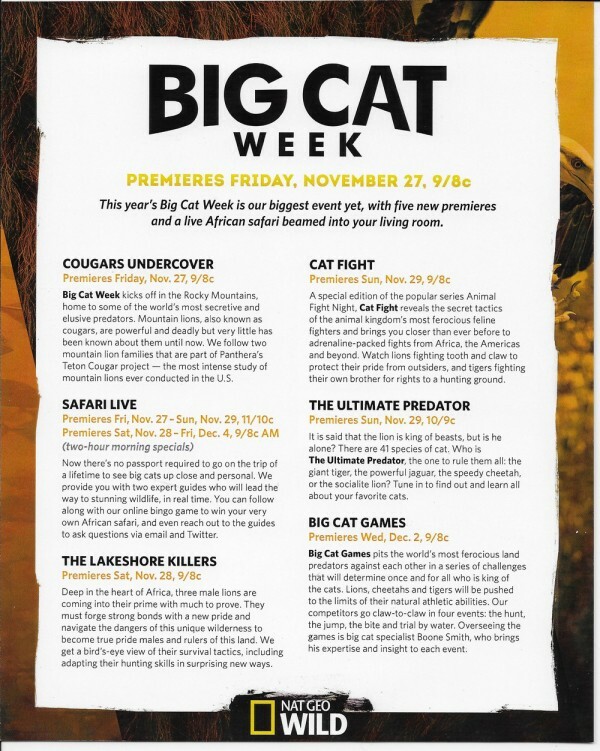 I am definitely going to watch big cat week for sure. I love the big cats such as the Lions and cougars. This sounds great! It would be perfect for the kids, it’s nice that they will get to know the different kinds of animals while playing. Wings of Life is going to be amazing!! My Addie would love it- she loves butterflies and hummingbirds! I’ll have to ask my oldest kid and see what he’d like. I’m not big on nature-related programming. Wow, it looks like there are some great programs coming soon. I have to make sure to tune in to them! I LOVE Nat Geo!!! I’ll definitely be tuning in for more than a few of these!!! Thanks for the heads up! Oh, this is such a great list and definitely will be watching! Such a great homeschooling resource that I can use even on Thanksgiving Day! Plus, the bingo game looks like so much fun! My son loves the Nat Geo shows. I will tell him about this. He will surely want to see all these. We have never seen any of these, so glad you shared. I will try to tune in into these. okay now, hold on there while I go set this up for DVR recording! My kids LOVE LOVE LOVE to watch all these shows – thanks for the update! We saw the Deep Blue, and it was awesome! My daughter love all these shows. My kids are going to LOVE tuning in for these! They adore everything National Geographic does. Thanks for the heads up! How fun! My kids would love this. We just visited Animal Kingdom at Disney World a week ago. That’s fun that Meryl Streep is the narrator. This sounds interesting to me. Sounds like a great show lineup. My son loves learning about animals. All of these shows sound great – my kids love watching, especially sharks and lions. What a great grand prize!